Hong Kong will see an on-premise release only, to be available by the glass and bottle from Island Shangri-La's excellent (and recent award-winning) Lobster Bar. Sydney bar and good friends of TimeforWhisky Tokyo Bird (whom Hendy visited back in May) are holding a unique Japanese Christmas whisky dinner on 22nd December, pairing five courses with five Japanese whiskies, spanning different styles, ages and distilleries. "Over two sittings guests will be served a degustation of five unique Japanese blended and single malt whiskies which are not available in the local market, matched to five courses of izakaya-style food with a festive focus. The Tokyo Bird bar team has selected five Japanese whiskies from Tokyo Bird’s extensive back bar from both major distilleries – Suntory Whisky and Nikka Whisky – and independent Japanese whisky distilleries to feature at the Christmas Whisky Dinner. 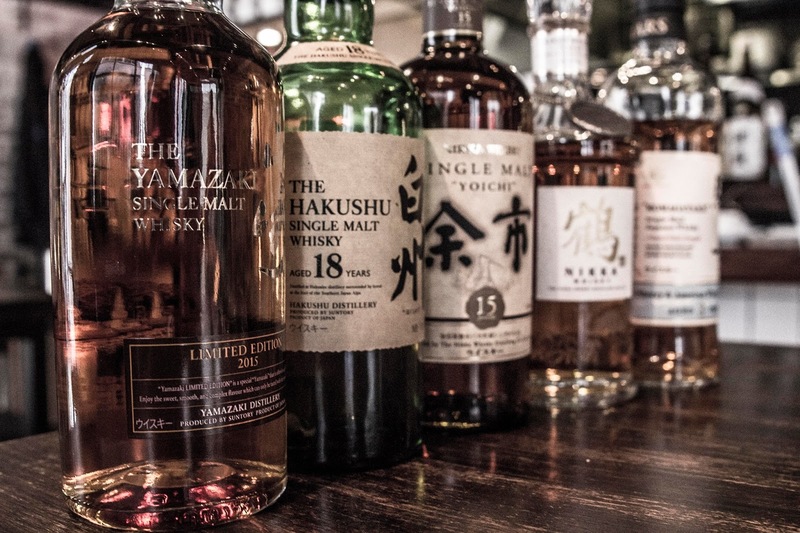 “We wanted to treat our loyal customers and Sydney’s whisky lovers with this unique menu of Japanese whiskies, which you probably wouldn’t see anywhere else in Australia,” said Tokyo Bird bar manager, Yoshi Onishi. 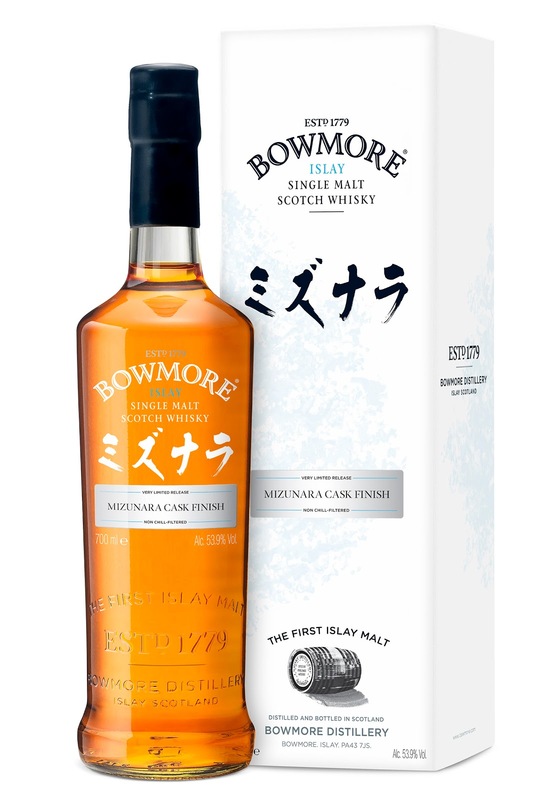 “We’ve picked a varied range which showcases the breadth and depth of Japanese whiskies; including a buttery soft blended whisky from an independent distillery, a uniquely Japanese grain whisky, and then moving on to some heavy hitting pure malt and single malt whiskies, including a World Whiskies Award 2015 winner,” said Yoshi." Sounds like a pretty great dinner to us. Tickets: $135 per person; available via info@tokyobird.com.au. Bookings are essential. New Hong Kong Bar - "Foxglove"
We received an invite to a whisky event a few weeks ago, and were told it would be at a new, secret bar in Central. The event, to be held next week, is not for your average whisky (fair to say it'll be one of the rarest / most expensive we've tried this year), so we knew the bar was going to be impressive. Turns out, that bar was "Foxglove", a new bar in Icehouse / Duddell St Central, modelled on a "drinking den of the 1950s", from the Ming Fat Group (known for the excellent "Mrs Pound" in Sheung Wan). "Set within 4,300 square feet on one floor, Foxglove is one of central Hong Kong’s most exclusive venues. Travel back in time with our selection of rare cognac and spirits, bottled in the 1930s, 40s, and 50s and aged for as long as half a century. Bottles from defunct distilleries as well as Japanese cask-strength whiskies are also available. Journey through the decades and taste our iconic cocktails from each era, dating as far back as the start of the 20th century. A carefully crafted cocktail menu pays homage to a bygone time when spirits were king and bartenders revered. Kick back with one of our classic cocktails – the Sazerac – or sip a rare, vintage brandy bottled in the 1930s paired with fine European cuisine. The main lounge area is spacious enough to accommodate 80 guests seated. The focal point of the room is a stage, where Foxglove’s resident jazz band and special acts performs live sets every week. For intimate gatherings, a VIP room, inspired by first-class train cabins, offers seating for up to 32 guests." We love Mrs Pound and we also love old, ancient spirits bottles, so this sounds right up our alley. Full review to follow in December. 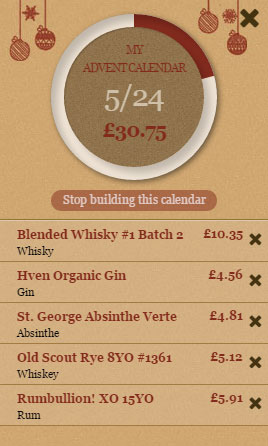 We mentioned a few months ago that Master of Malt's Christmas advent calendars were back with a vengeance, and now they've taken it one step further with the ability to "build your own". With 4,000 drams to choose from, this sounds like a bloody good way to design a custom Christmas present for any whisky lovers you might know (or you know...yourself). Add a few cheapies you've been meaning to try, a few special occasion drams...add it up and away you go. We had a play with the interface and it's slick, fun and somewhat addictive. Check it out here. The launch of Chivas Regal "The Icon" in the Australian market follows the launch of the Chivas "Extra", this time last year. Despite belonging to the same Chivas family, these two expressions are markedly different, with The Icon being an exclusive travel retail bottling targeted at the ultra-premium end of the market, contrasting with the Extra which is now available across bars and liquor retailers nationally. The difference between the two expressions does not instantly mean a difference in quality - in fact I am a fan of the Extra with its inherent richness and depth derived from a portion of Oloroso sherry cask matured whiskies. The whisky itself is housed in a specially hand-blown crystal decanter crafted by the guys at Dartington Crystal in Devon, United Kingdom. 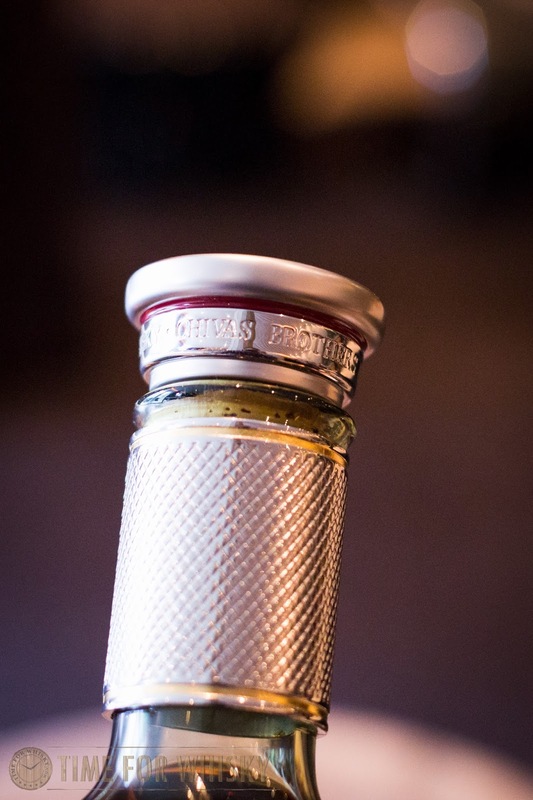 A signature "luckenbooth" symbol stopper which represents the traditional Celtic symbol of love - featured as a seal for the bottle. 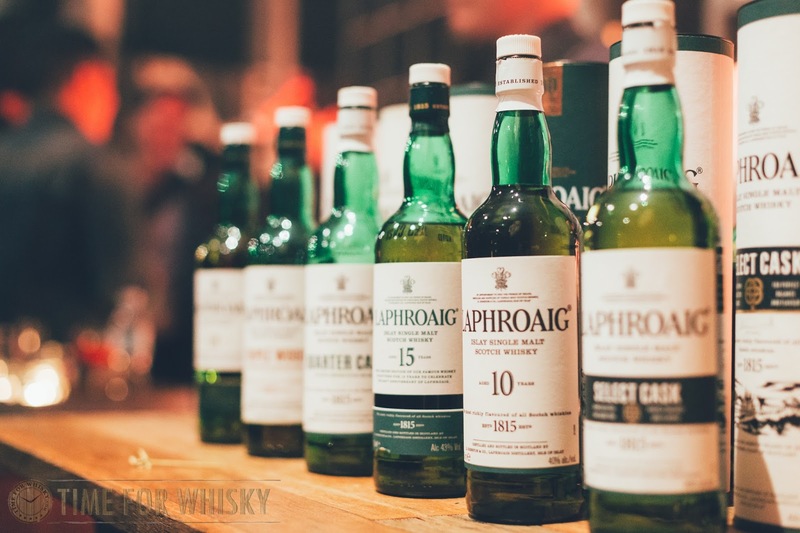 Before presenting The Icon for tasting, Colin suggested a brief whisky blending masterclass to explain the blending process and exemplify the variation in notes that can be derived from different blends. Colin spoke to the beauty of blending and how having a large amount of different whiskies and flavour notes can be advantageous and quite a blessing to blenders. Having been a fan of single malt and extremities from one single malt to another over the years, I was intrigued at the idea. Two whiskies were presented for blending. The first whisky presented was an aged Strathisla, the core malt in any Chivas blend. The particular whisky presented was matured in ex-oloroso sherry casks for over 25 years. It carried a gold appearance and was fruity and sweet on the nose, with fruit cake, honey, raisins and sticky date notes all around. The palate of this particular whisky was soft - apple and dried spices were prominent with some meringue and chilli chocolate notes. It finished long and gentle with a hint of lingering peppermint. The second whisky, a blended grain, matured in an ex-Bourbon barrel provided typical ex-Bourbon matured Scotch notes including honey and orange/citrus. Grain whisky plays a pivotal role in the composition of blends, often used as a base. This particular grain whisky was quite volatile on the palate, there were Christmas cake, clove, black pepper and cherry notes. The finish was soft and peppery though rather short. Mixing the Strathisla with the grain whisky, various notes from both whiskies amalgamated with the blend becoming less volatile and the raisins and fruitcake notes from the Strathisla becoming more dominant. 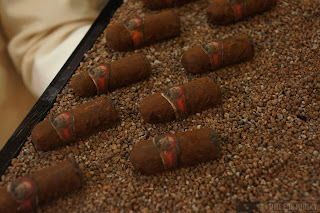 Depending on the ratio of Strathisla and the grain, we could balance between the dominant notes of the ex-oloroso and the dominant notes of the ex-bourbon. It was certainly an interesting experiment and adding a splash of water further transformed the blend. 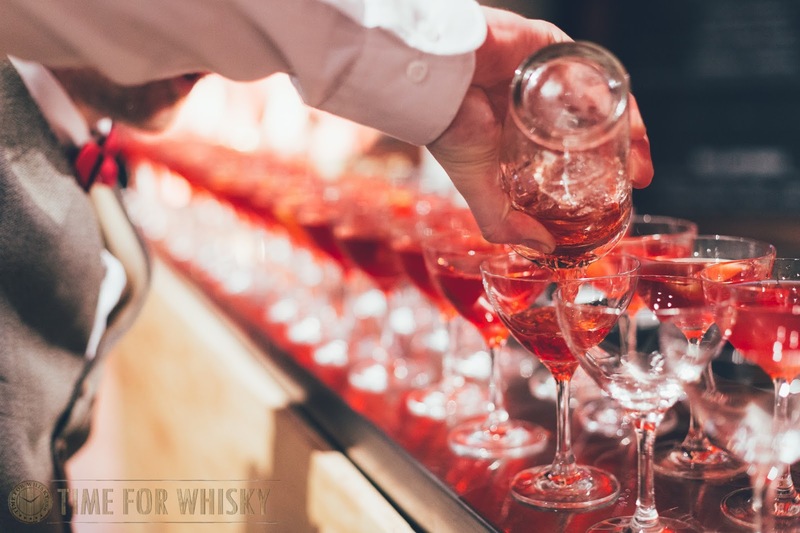 The art of blending is no easy feat and Master Blenders can spend hours on end experimenting with different permutations of anywhere between two to over fifty different whiskies to try and maintain consistency with their blended whiskies. Following our brief masterclass on the art of blending, it was onto the main highlight, The Icon. The Icon encompasses "nuggets of flavours from lost distilleries", Colin described as he passed the remarkably heavy and dense green-hued crystal decanter around the room. 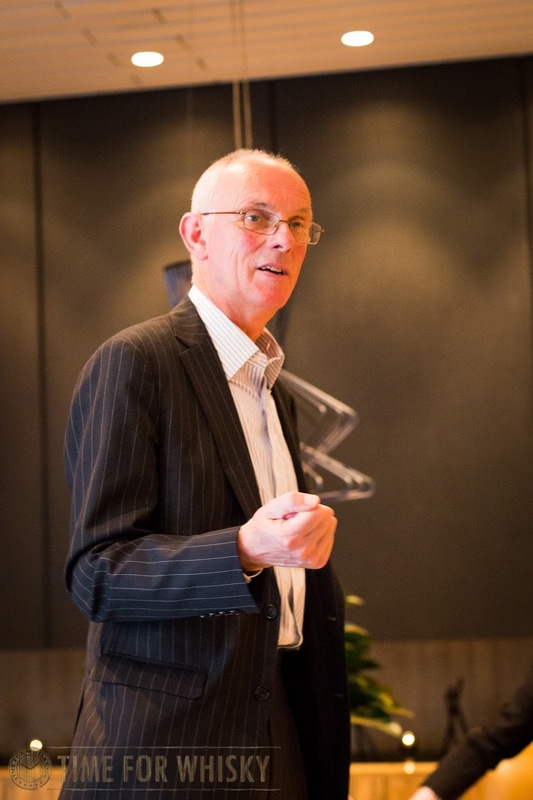 Colin explained how, each year, only a limited number of bottles will be released to the market, potentially making it a limited edition, collectors item for whisky fans (though that is in contrast to the beliefs of many that whisky should be enjoyed rather than collected). Only 1,500 bottles will be released globally this year with an increase to around 1,800 bottles in 2016 and in 2017. Despite the total global allocation, Australia will only receive 30 bottles for its duty free market. With the small number of international airports and duty free stores across those airports, and the significant price point ($4,699AUD), the allocation may well be appropriate - clearly The Icon sits deep into the high ultra-premium whisky end of the market. So how do all the unique features and exclusivity of the Icon stack up with the whisky that it represents? A premium limited edition blended whisky that features some of the rarest, oldest whiskies from mothballed distilleries in its blend. Collect it or drink it, personally, The Icon is an enjoyable whisky and presents a level of complexity on the nose and palate. Palate: The palate is soft, gentle almost creamy. The orange citrus appeared on the palate as it did on the nose, peach, vanilla cake and (gummy bears) notes followed. There's a hint of peat on the finish. Chivas Regal The Icon is an ultra-premium travel retail offering and one that has been crafted with a mixture of new and old. Overall, The Icon is a complex blend and showcases the output of the art of blending, especially the art of blending with old whiskies from mothballed distilleries. Look out for The Icon next time you pass through duty free, and take the time to appreciate the finer details The Icon displays. 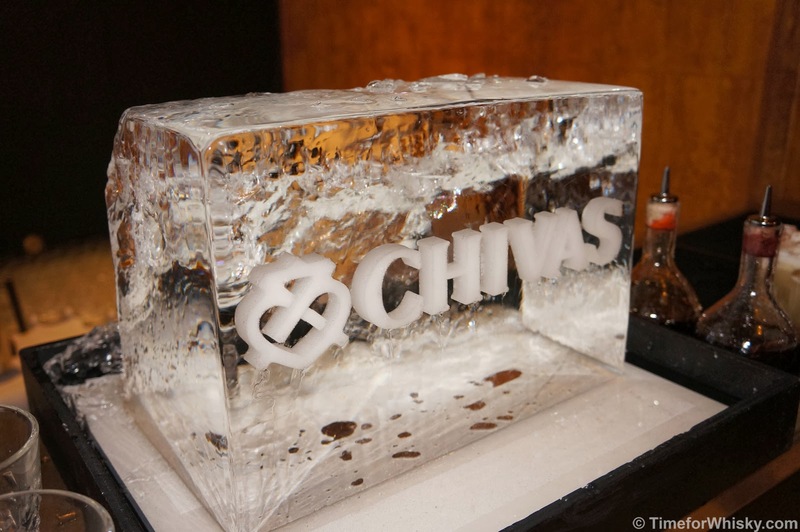 Time for Whisky would like to thank Pernod Ricard Australia and Cav Con for having us as part of the Chivas Regal 'The Icon' launch. Back in 2013, we launched a list of "Top Sydney bars: The (sort of but not entirely) definitive list (of good ones)". We try to keep it up to date, and almost 2 years on, it's still one of the most popular posts on this blog (right next to, interestingly, this Glenfiddich post). I've been toying with the idea of a similar list for Hong Kong (especially seeing as we've already reviewed a few), but the bar scene here, whilst fantastic, is so ever-changing that it would be a nightmare to maintain such a list. ...a list of Hong Kong's best whisky bars though, I figured, should be much more manageable...and so, I finally decided to turn the haphazard list I'd been keeping into my phone into a list for the blog, using the same format as our Sydney list (name, link, address, brief 1-2 line description, link to our review, and sorted by region). Please enjoy, and if you think I've left any out (quite likely) please let me know! 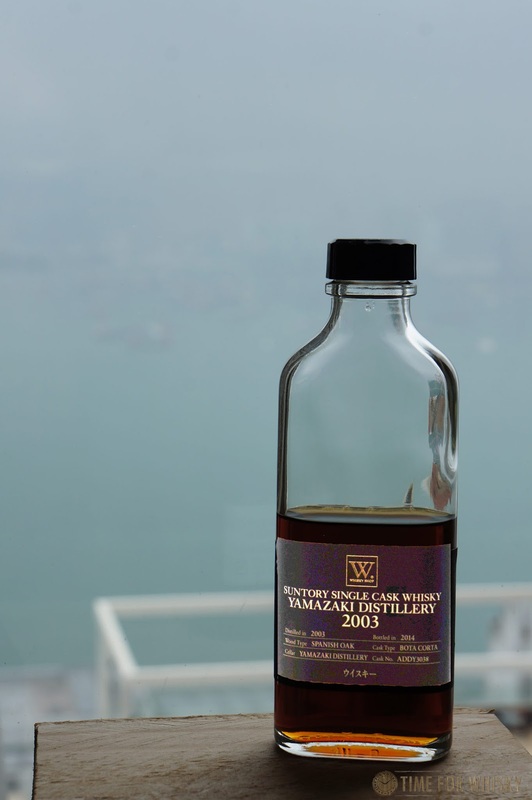 Although note: we've seen quite a few HK whisky lists over the years and found a lot of them seem to include a few bars we wouldn't really consider "whisky bars". 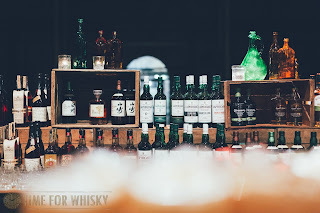 Having 30 commonplace scotch whiskies on the menu does not make for a "whisky bar", in our opinion, and so the list below tries to include only bars that focus, mostly exclusively, on whisky. Club Qing (10/F, Cosmos Building, 8-11 Lan Kwai Fong). A relative newcomer, but owned and managed by those who very much know their whisky. The selection here spans multiple countries and their old and rare bottles (keep an eye on their Facebook page) are incredible, as is the full set of Ichiro's Malt Cards they have lining one of the walls. Prices are reasonable, staff are incredibly friendly/engaging/helpful, and the bar caters equally well to whisky fans and newbies alike. One of my favourites in HK. Nocturne (35 Peel Street, Soho) - See our review here. If Angel's Share is mostly about Scotch, Nocturne is all about Japanese whisky (and wine). Intimate and dimly lit, with an interesting industrial-yet-warm interior, you'll find a great range of Japanese drams, all ordered from a Samsung tablet. The prices aren't cheap, especially for those who aren't used to HK whisky prices, but their selection is excellent. Chinnery (Mandarin Oriental Hong Kong, 5 Connaught Rd) - An intimate and old-school whisky den in the equally intimate and old school (yet unmistakably luxurious) Mandarin Oriental Hong Kong. 001 (97 Wellington St officially, although the most common entrance is via a hidden door in Graham St's wetmarket) - Located under popular whisky shop Liquor and Liqueur, 001 is probably most well-known as a cocktail bar, but don't overlook its whisky credentials. Single cask bottlings and, rare, hard to find drams are commonplace here. Pricing is on the higher end for HK whisky bars, but it's worth a visit if you're looking for a unique dram. Get in early as it gets busy / selective on popular nights. Butler Shelter (29/F, Asia Pacific Centre, 8 Wyndham St) - An outpost of the original Butler Bar in TST (see "Kowloon side" below). Small, quiet and very Japanese, the selection is limited but well-curated, the cocktails are expertly made (we once watched one of the bartenders spend 20 minutes just getting air bubbles out of the ice mould he was about to freeze) and the drams include something for everyone. Price-wise I'd say about "middle of the road" for HK whisky bars. Sadly closed as of Dec 2015. Ginger (G/F, 12 On Wo Lane, Sheung Wan) - Ginger is only a few doors up from Ronin, but focuses more heavily on Scotch than Japanese whisky, in particular, lots of interesting IBs and distillery-only releases. If a sought-after bottle has been released in HK, you can probably bet Tony and Vincent have it within weeks, available by the dram at Ginger. A warm-yet-industrial funky interior, a decent selection of drams, a nice upstairs area (good for groups) and a great selection of Ardbeg (they're an official Ardbeg Embassy) make this a decent bar to visit. Prices are quite reasonable for HK, and they have their own Casks of Distinction Lagavulin 23yo too, which is well worth a try. 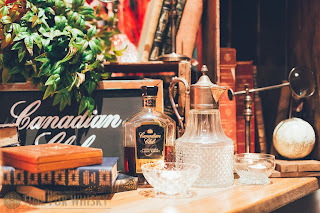 Whisky & Words (No 7, Shin Hing Street, Sheung Wan) - One of two openings in/around August 2018, Whisky & Words has only been open a few weeks but is already drawing high praise and a solid crowd. As soon as we visit we'll provide more detail. Ronin (8 On Wo Lane, Sheung Wan) - Probably the place to go for Japanese whisky in HK, although it has to be said, bring your wallet. The selection is amazing (as is the food - seriously), but you'll pay for it. Looking for a rare Karuizawa, limited edition Yamazaki (e.g. Bourbon Barrel), single cask Akashi or the like? Good chance you'll find it here. If you're planning to visit on a Fri/Sat though, book early. It's small and incredibly popular. SAFE Bubbles and Malt (Shop 2, 1/F Manhattan Avenue, 255 Queens Rd Central, Sheung Wan) - I wasn't sure what to make of SAFE at first. On the one hand, they have the credentials (official SWMS bar, regular tastings, and one of the most insane collections of rare/expensive whisky you've ever seen in one place outside of perhaps The Macallan Bar Macau, or the Diageo Claive Vidiz collection), but on the other hand, with concrete flooring, coloured lights and lots of polished metal, it doesn't really feel like a traditional whisky bar. Then again, there's nothing wrong with breaking tradition. Prices are on the higher side (especially if you're used to SWMS prices in places like the UK and Australia), but as we've said, whisky isn't cheap in HK (thank the 100% tax we face here). You'll find drams here that you're unlikely to find anywhere else in HK (but make sure you also take time to gaze at / drool over the collection in the cabinets, which includes a 60 year old OB Glenfarclas and a Monochrome Joker). 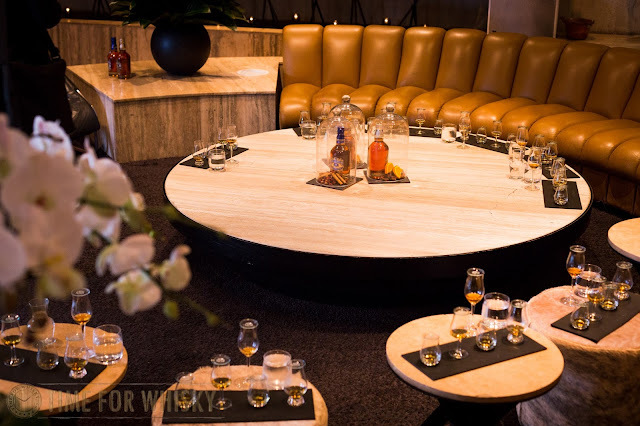 Casky (Shop 1 G/F, Golden Star Building, 20-24 Lockhart Road, Wan Chai) - The other August 2018 opening, Casky has already (in its first few weeks) held some fantastic events with some big names from the HK and Asian whisky worlds. We'll be visiting soon and will update this post with our thoughts soon. Mizunara The Library (4/F, Kiu Yin Commercial Building, 361-363 Lockhart Rd, Wan Chai) - About as “Japanese” a bar as you can get in HK. Impeccable drinks and service, but very, very expensive. Their range of Japanese whiskies is ever-expanding (and includes some photo-worthy gems), and the whiskies in the "library" of malts around the room are incredible, but you'll pay for them. Endo-san who looks after the bar here made me one of the best cocktails I've ever had in HK, but it was also by far the most expensive I've ever had in HK, at well over $220HKD. But hey, quality costs. Update: On a recent visit we learned that the bar is happy to offer half and even one-third drams of some malts (like most whisky bars in Japan). We love bars that do that, as it brings a number of rare/expensive whiskies into the realms of possibility for a number of whisky fans. b.a.r Executive Bar (27/F, Bartlock Centre, 3 Yiu Wa St, Causeway Bay) - Part of the old brigade - touted as being a "private bar", but as long as you call and make a reservation, in our experience, generally anyone respectable can get in. A great selection of Japanese, Scottish and even a few Aussie drams, but not cheap. A good spot to find a few rare drams you might be seeking (for us, it was the 2009 Ardbeg Supernova). The Canny Man (Wharney Guang Dong Hotel Hong Kong, 57-73 Lockhart Rd, Wan Chai) - Think Scottish pub and you're pretty much on the money. Over 100 drams available. Tiffany's New York Bar (Lobby Level, InterContinental Grand Stanford, 70 Mody Rd, TST East) - This place doesn't get all the respect it deserves in the HK whisky scene. 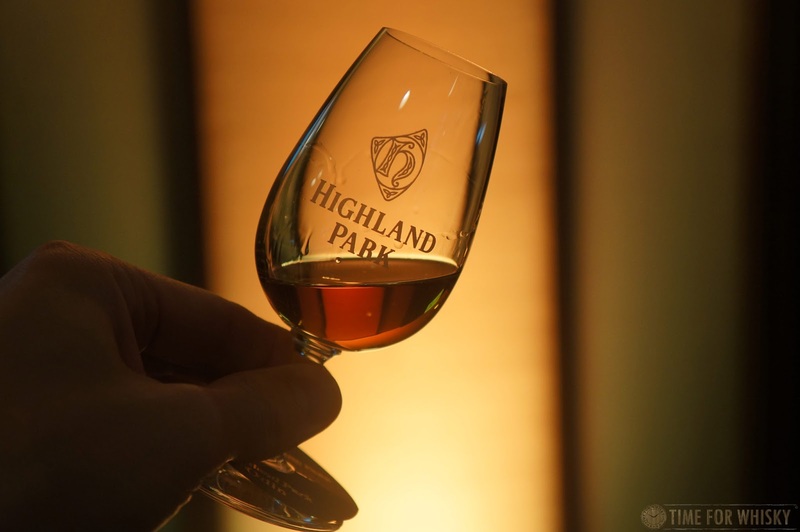 A large (and ever-expanding) list, great staff, comfortable settings, low ceiling, regular jazz, frequent tastings and their own cask-aged whiskies all come together to make this one of HK's greats. If there's any doubt, just look at who visits when they're in town - David Stewart and George Grant, to name just two whisky legends who we've met at Tiffany's in the past few months. Prices are fair and they also have good deals on bottles - including 2-for-1 on certain nights. 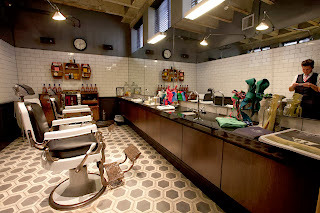 Butler Bar (5/F, Mody House, 30 Mody Rd, TST) - One of HK’s original whisky bars. Very Japanese. Quiet, unassuming, with typical Japanese perfection in bartending. Cocktails and drams alike are all excellent here. Prices are about middle of the road for HK. Bar Buonasera (7/F, Mody House, 30 Mody Rd, TST) - No, that isn't a typo this place really is just two levels above Butler Bar, and like Butler, it's also an old-school Japanese bar with a strong focus on classic cocktails and fantastic (often Japanese) whiskies. An offshoot of the famous Osaka bar by the same name, Bar Buonasera HK will often open rare / hard to find Japanese whiskies by the dram, and they also host the occasional guest bartender, focusing on whisky cocktails. Whisky Stables (Hullett House, 1881 Heritage, 2A Canton Rd, TST) - HK's first "Whisky Ambassador" accredited bar sees a decent selection (including a few Mackmyras rarely seen elsewhere in HK), comfortable seating and great staff come together to make a comfortable and inviting whisky bar. Great for drinks before/after dinner at one of Hullett House's restaurants, or just for a dram on its own. The heritage building adds to the charm, and the terrace, albeit small, is a nice addition not often seen in HK's whisky bars. Chin Chin (3/F, Hyatt Regency Hong Kong, 18 Hanoi Road, TST) - Could initially be dismissed as your average hotel bar (live band, large, often full of business travellers) but before you write it off it, have a look at the Chinese decor/bar, and the drams within. Some rarities (with a focus on Scotch) and some good 2-for-1 specials at times. A nice place to drop into for one or two if in the area, or looking for a break from shopping at the (often sensory-overloading) K11 Art Mall! * In the interests of full disclosure, I own a small stake in The ThirtySix. Without going into too much detail about Whisky Shop W (read this Nonjatta post for a great overview), it's Suntory's own shop in Osaka, and despite being small, always has a few goodies in store for the whisky lover, such as their 300mL shop-only bottlings of Hakushu, Yamazaki and Chita, which are incredible value and sadly sell for stupid amounts of money here in Hong Kong (we opened ours and shared it with friends). Occasionally though, they have something even more special - sometimes behind the counter, sometimes something that you have to ask really nicely for. Colour: Coffee. Dark, rich, coffee. Nose: Rich, juicy plums and Christmas cake. Palate: Rich red berries, luscious, juicy cherries, and some cocoa. Coffee, brazil nuts and big Oloroso-style notes. So far - incredible. Rating (on my very non-scientific scale): 94/100. Amazing - one of the best single cask Japanese whiskies I've ever tried. 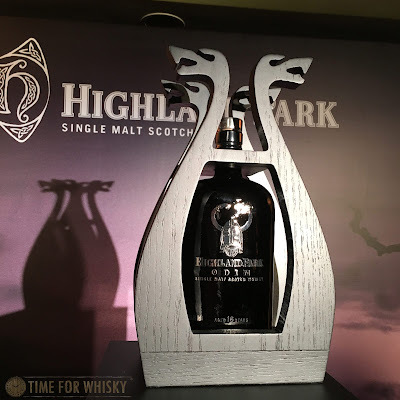 A year ago to the day, we posted our write-up of the Highland Park "Freya" Hong Kong launch (which, due to an unfortunate shipping hold-up didn't actually feature any Freya, but had something much rarer instead), and today we're following up with the final whisky in the Highland Park Valhalla Collection - the "Allfather" Odin. Following Loki, Thor and Freya, Odin rounds out the collection with a big, robust 55.8% dram befitting of the powerful Norse god. Launched earlier this year in the UK, last week saw the whisky finally released in Hong Kong (in very limited numbers, no doubt). 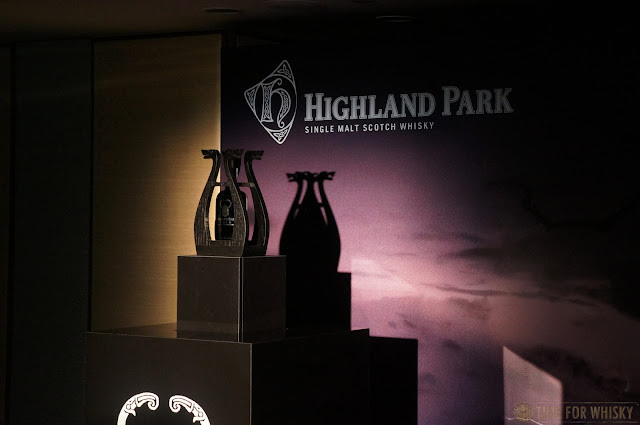 Held at Hong Kong's iconic Mandarin Oriental Hong Kong, the night kicked off with Champagne-style cocktails (made with Highland Park 12), before drams of Hong Kong's favourite Dark Origins were served. After a few of said cocktails, some amazing mini-cigar chocolates, and some time spent admiring the various bottles dotted around the room (including the 30yo, Freya, Loki, Thor and others), Highland Park's Global Brand Ambassador Daryl Haldane took the stage to present the reason we were all there. 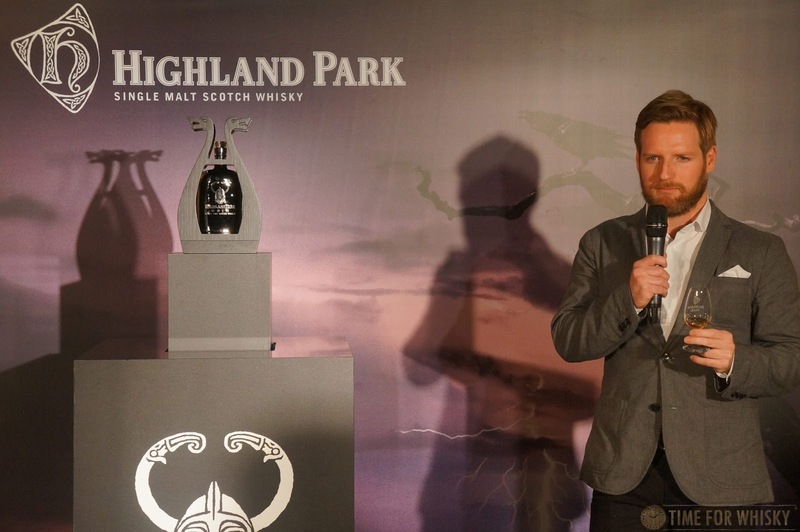 Talking us through Highland Park's history (from it's Orkney Islands home and their Norse heritage, to the Highland Park's early days as an illicit distiller, through to the current day), Daryl gave an interesting insight into the unique and unusual northern Scottish distillery. Then, in a flurry of simulated lightning, the Odin rose from the floor as drams were handed around the room. See below for our thoughts. Nose: Definite spice - cinnamon and cloves, with a hint of smoke and some orange peel After 10-15min, some bitter chocolate notes develop. Palate: A decent amount of smoke (not typical "peaty" smoke like an Islay peated whisky - a more subtle, earthy smoke, likely due to the use of Orkney peat). Big malty characteristics and lots of bitter cocoa and nutty notes. Finish: Long and charred - some residual spice, a hint of sweetness and brazil nuts. Subtle smoke to the end. Rating (on my very non-scientific scale): 93/100. Very good - complex, and ever-changing (the nose especially changed over 20 minutes or so). Clearly sherried, but not a typical "sherry bomb". I'd probably buy bottle if available at retail. After a decent chat with Daryl (who was a great bloke and full of stories) it was time to call it a night, but not before one quick photo (also with David Vitale (of Starward / New World Whisky Distillery) who was in town for a few days. 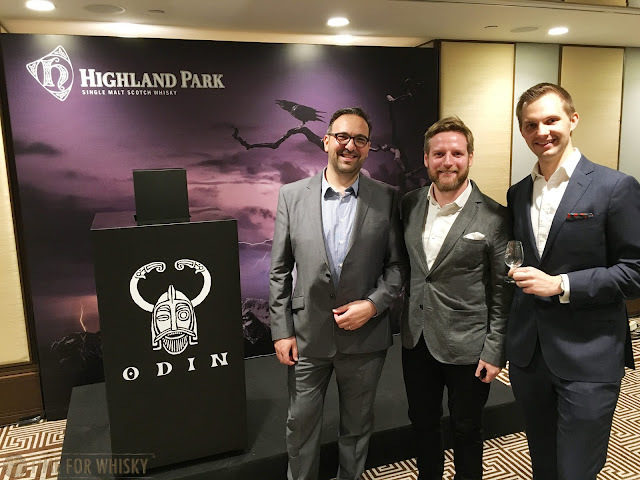 David Vitale (of Starward / New World Whisky Distillery, Highland Park Global Brand Ambassador Daryl Haldane and Martin. Another big thanks to Edrington HK and Lee Wolter PR for another enjoyable launch. 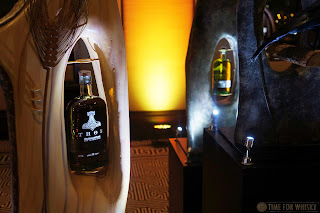 Hendy recently attended the Australian launch of Chivas Regal The Icon - an ultra-prestige blend including whisky from a number of mothballed distilleries (edit: detailed write-up and tasting notes here). 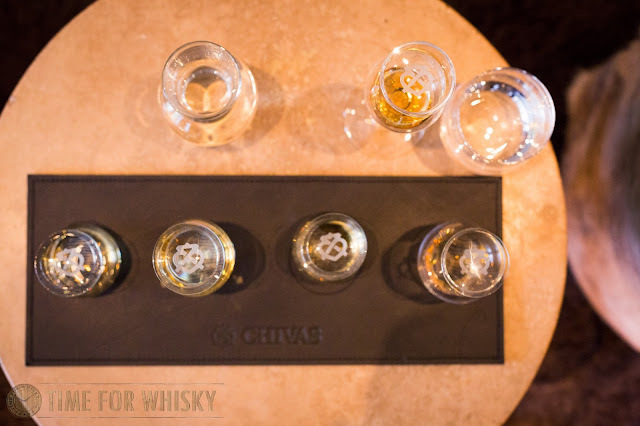 "Chivas Regal The Icon is the perfect balance of old and new, with each distillery imparting its own unique characteristics. At its heart lie the rarest malts from Strathisla, the spiritual home of Chivas Regal, and the oldest continuously operating distillery in the Scottish Highlands. 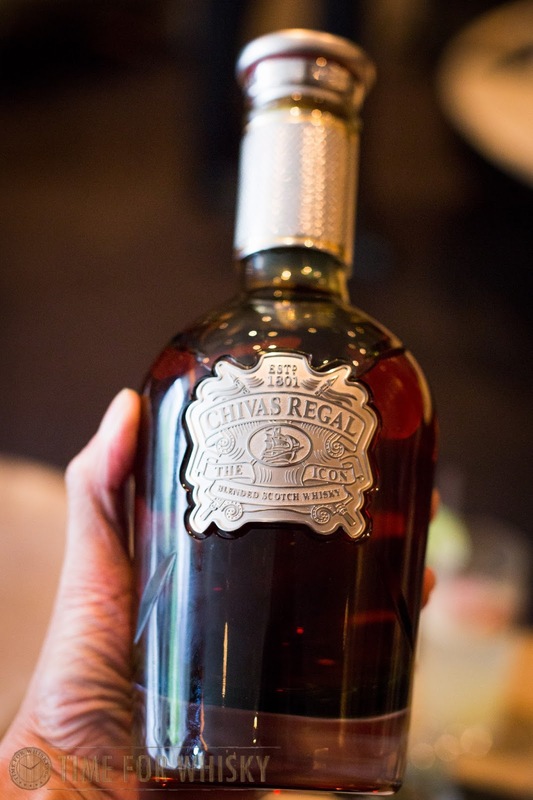 Accented with hand-selected single malts from Longmorn and Glen Keith, Chivas Regal The Icon is a bold, balanced and unforgettable blend specifically developed with discerning whisky connoisseurs in mind. 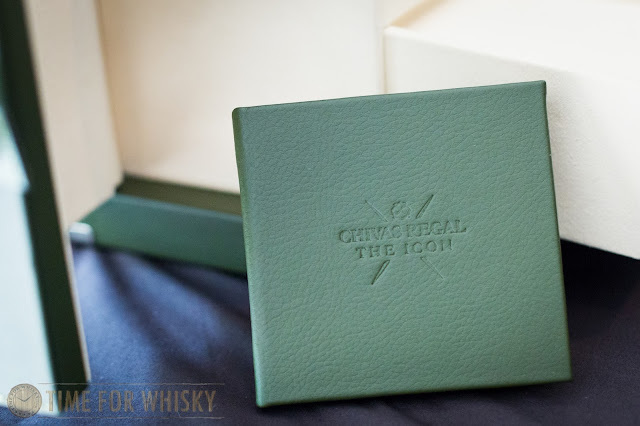 Each year, a limited number of bottles of Chivas Regal The Icon will be available, making it a must-have product for whisky adorers and collectors alike. Presented in an elegant bottle, each decanter of Chivas Regal The Icon has been hand-blown by dedicated master craftsmen at Dartington Crystal before being hand-filled with the luxury liquid. The glass is delicately etched and finished with precision crafted metalwork and presented in sublime green glassware in homage to the original green Chivas Regal bottle that captured the world’s attention in 1909. Adorned with a signature luckenbooth stopper, a traditional Celtic symbol of love, the distinctive bottle is certain to be adored by whisky enthusiasts around the world. The limited edition of Chivas Regal The Icon is available by private order only at HK$28,800"
Ok so this one's not purely whisky-related, but Movember is a charity we strongly support (I'm actually doing it for the 7th year this year - feel free to donate a few bucks if you like!) and when we heard they teamed up with QT Sydney and Chivas Regal to further their excellent causes, we figured it warranted featuring. 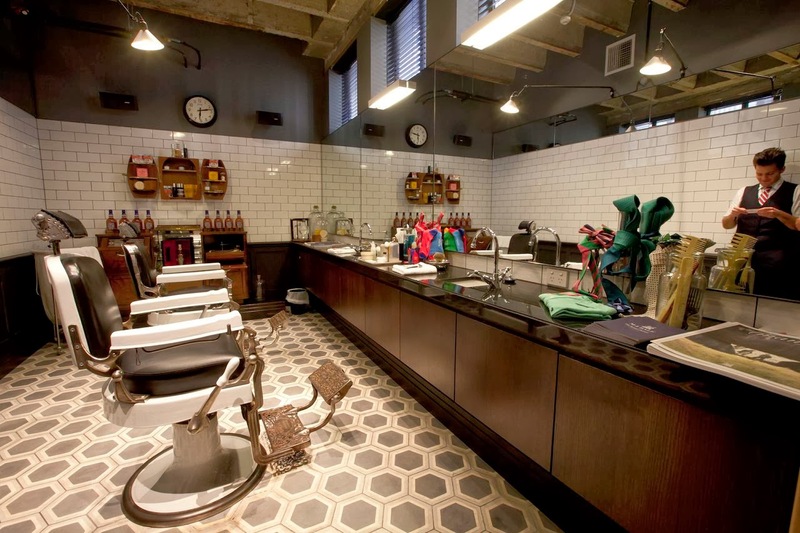 QT Sydney will donate $10 from all other shave services undertaken during the month to Movember ensuring guests who may not be ‘Mo-ing’ can still shave for the cause. QT Sydney will donate $4 from every Parlour Lane MO’hito and all gold coin stick-on moustache proceeds to Movember. Back in May of this year, we mentioned The Last Drop Distillers had releases their 1967 Glen Garioch Single Malt Scotch Whisky & 48 Year Old Blended Scotch Whisky in Hong Kong. Fast forward a few months, and those same whiskies are now available in Australia, via Dan Murphy's. "November (Sydney, Australia) - Purveyors of exclusive, super premium spirits, The Last Drop Distillers Limited, announces the launch of its newest expressions in Australia; The Last Drop 1967 Glen Garioch Single Malt Scotch Whisky and 48 Year Old Blended Scotch Whisky – both awards winners in the Jim Murray Whisky Bible 2015. 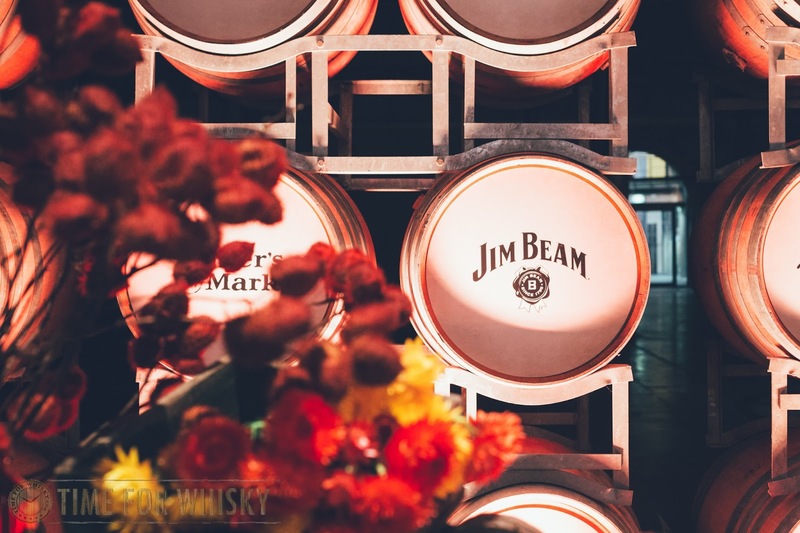 Founders and whisky industry veterans, James Espey, Tom Jago and Peter Flack, have enjoyed long and illustrious careers in the wine and spirits trade. The trio have channelled their unrivalled passion for premium spirits into creating the world’s most exclusive spirits company, The Last Drop Distillers Limited. Today, James and Tom, with the help of their daughters, Creative Director, Rebecca Jago and Marketing Director, Beanie Espey, tap into their combined 120 years experience in the industry to seek out the rarest and most exclusive distillations and deliver them to discerning spirits enthusiasts around the world. In past roles, James and Tom have worked together on some of the most iconic names in Scotch whisky, including Johnnie Walker Blue Label and Chivas Regal 18 Years Old, as well as Malibu and Baileys Irish Cream; two of the most original and successful new drinks categories in the world. Tantalising the tastes of Australian whisky aficionados, the brand’s newest drops, the 1967 Glen Garioch Single Malt Scotch Whisky and 48 Year Old Blended Scotch Whisky, are now available in limited supply through Dan Murphy’s online and selected Dan Murphy’s stores. The Last Drop’s Directors regularly look to the cellars of Scotland where they have long procured some of the most elegant barrelled spirits in the world. Unearthed at Glen Garioch, one of the Scotland’s oldest distilleries, the 1967 Glen Garioch Scotch Whisky is a 47-year-old single malt. Initially created as a robust and ‘peated’ whisky, the liquid was stored in a Bourbon style remade Hogshead cask and has matured into a more mellow, beautifully balanced whisky with an unexpected hint of honey and apple sweetness. The spirit has been awarded 96.5 points by leading international Whisky commentator, Jim Murray, and is the recipient of the 2015 Single Malt Scotch Whisky of the Year. Of 118 bottles existing in the world, just three bottles are available in Australia and can be purchased via Dan Murphy’s online and selected Dan Murphy’s stores for an RRP of $9,000 AUD. Several of the distilleries represented in this unique blend have long since closed, making this a truly rare and luxurious Scotch whisky unlike any other in the world. This unique blend has been awarded 96.5 points by leading international Whisky commentator, Jim Murray, and is both the 2015 Scotch Whisky of the Year and 2015 Scotch Blend of the Year. Of 592 bottles existing in the world, only three bottles are available in Australia via Dan Murphy’s online and selected Dan Murphy’s stores for an RRP of $5,500 AUD. “At The Last Drop, we’ve made it our mission to unearth the rarest and most discerning spirits in the world and bottle them for the enjoyment of spirits aficionados. We’re thrilled to bring these two exceptional expressions that are truly unique and provide Australian drinkers with a once-in-a-lifetime taste that can only be found in The Last Drop bottles,” says James Espey, Found and Chairman of The Last Drop Distillers. Each of The Last Drop’s selected spirits are bottled straight from the cask, corked and wax-dipped by hand before being housed in a signature Last Drop Distillers leather case. Each case includes a generous 50ml miniature as well as a leather-bound booklet that not only certifies the bottle, but also serves as a record of the buyer’s personal tasting notes as they explore the exceptional drops. 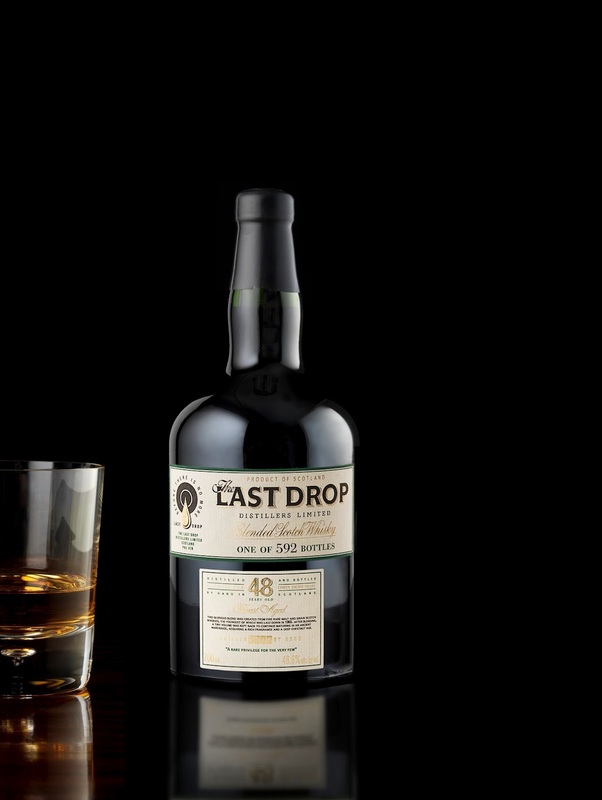 The Last Drop soft launched in Australia in 2014 with the release of The Last Drop 50 Year Old, six bottles of which are currently available via Dan Murphy’s online and in selected Dan Murphy’s stores for an RRP of $6,000 AUD." 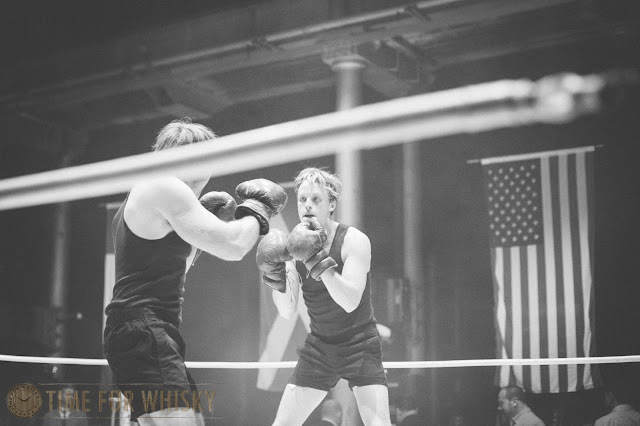 Not many details were revealed by Beam Suntory prior to the event, held in early September, dubbed 'The Great Whisky Rumble' - other than that it was to be 'the bout of the year, a whisky bout that is'. Having attended other Beam Suntory events recently, we knew we could expect great things from Suntory's wide-ranging portfolio of brands; Hibiki, Laphroaig, Canadian Club and Jim Beam. Joined by Suntory staff, fellow whisky lovers, whisky bloggers, media reps and others from the industry, we all converged at the Australian Technology Park ahead of the bout. 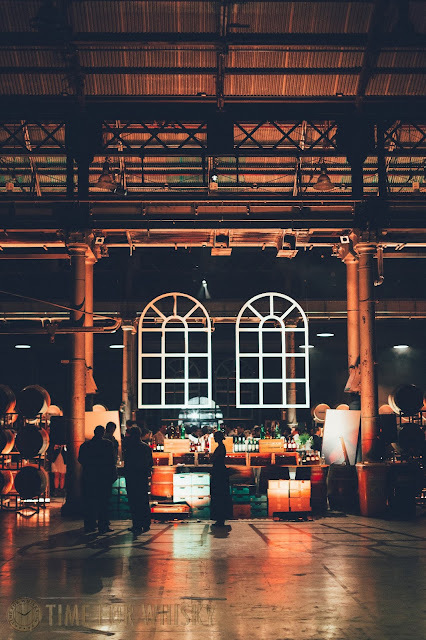 Walking through the locomotive workshop was reminiscent of the time I spent at last year's Jack Daniel's celebration when the whole site was transformed into a spectacular bar - this "rumble" being hosted at the back of the Australian Technology Park. 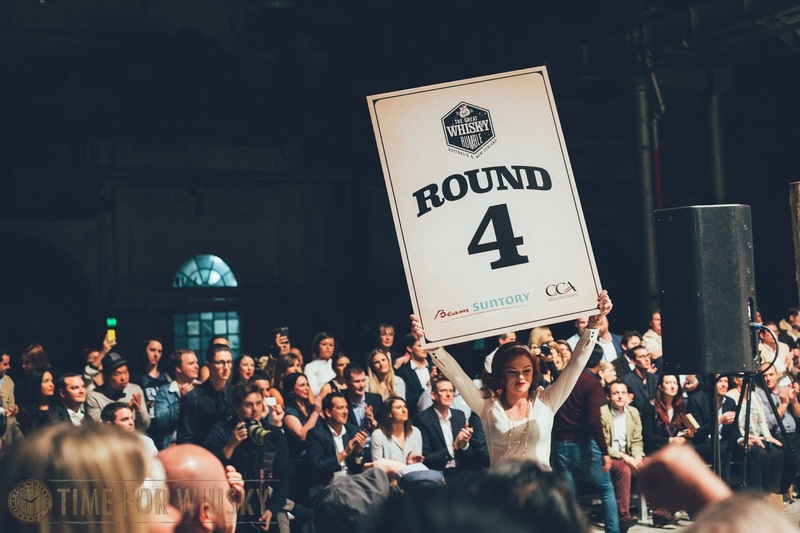 As we entered, we were graced by a spectacularly transformed space - lined with large feature windows, stacked bourbon barrels, old wooden artefacts and old Chev ute, the vintage decorated grand hall instantly transported us back to the early 1900s. 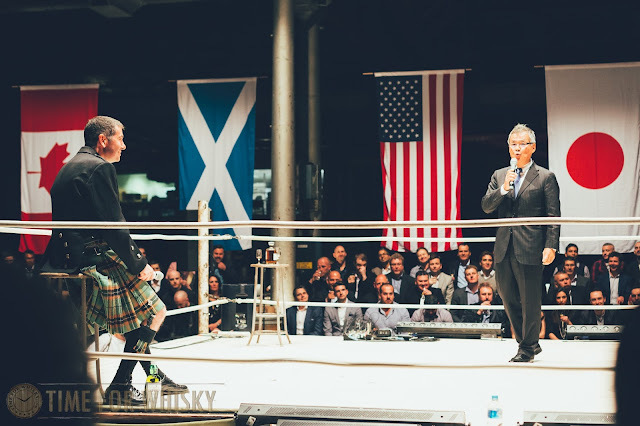 The charismatic Dylan explained how the rumble was to see the four great whisky legends go all out to present their brands, their stories and their whiskies - all set to take place on the main stage for the event - a real-life boxing ring. As the curtains were pulled back, a boxing ring was unveiled - inside, contenders already going at it (although simply for show). Seated around the ring, we were all given a tub of popcorn to munch on whilst we waited for the main event. It wasn't long until Dylan opened the main event, introducing the order for the night which saw Dan Tullio first up in the ring, followed by Mike Miyamoto, Fred Noe and finally John Campbell. The rule of the rumble, MC Dylan Howarth explained, was that he would present a series of questions to the four whisky figures, who would be given an opportunity to present their stories and their whiskies. At the end of the night, the crowds were to nominate their favourite as the winner. Dan highlighted the history of Canadian Club, dating back to 1858 and began with the founding father Hiram Walker who at the age of 40, decided to make whisky in Canada. 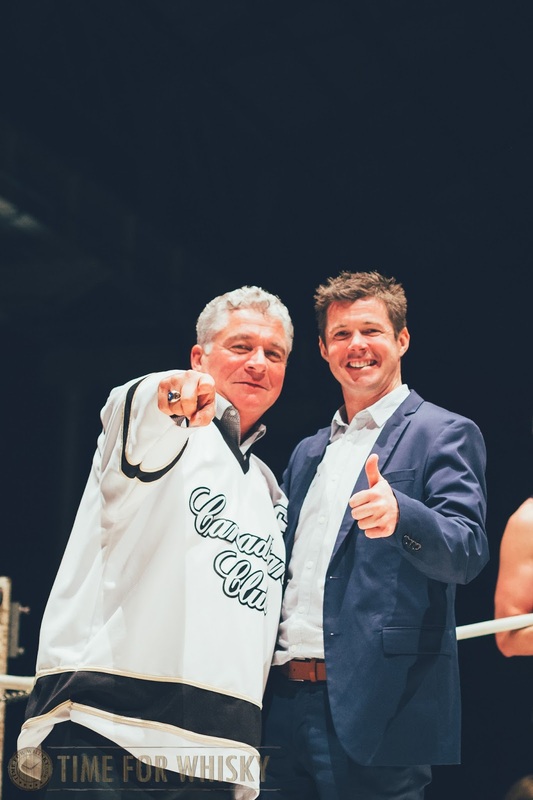 Roll forward to 2015 and Dan explained how over the years, Australia, as a market, had climbed up to the number three spot for Canadian Club in the world. The Canadian Club Classic 12 year old was presented by Dan for tasting. On stage, Dan was highly engaging and it was entertaining to see the odd bit of banter being thrown around between Dan and Noe regarding Canada and America. Mike Miyamoto led Round 2 - sharing similarities with the numerous whisky expressions he oversees; balanced and composed, Miyamoto spoke to the recently launched Hibiki Japanese Harmony. 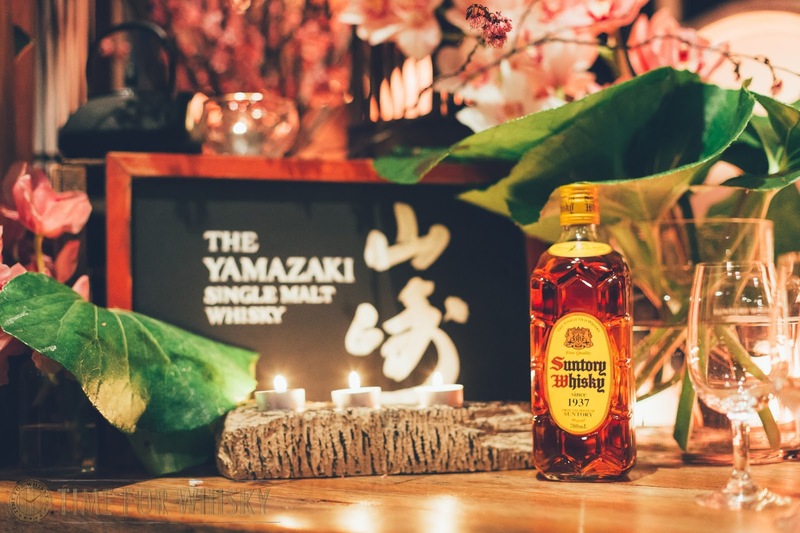 Miyamoto described the driver behind the Japanese Harmony expression and how the expression was inspired from the original Hibiki which was created in 1989 to commemorate the 90 year anniversary of Suntory. 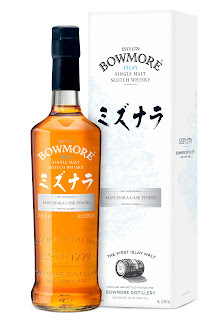 As noted during the launch back in August, I found the Japanese Harmony to be a clean, simple blend that may not be as bold-bodied as the aged Hibikis, though able to stand up as your daily dram or as Miyamoto puts it, a versatile expression that you can introduce to those who have not tasted whisky before or are interested in Japanese whisky. Fred Noe took the stage for round 3. 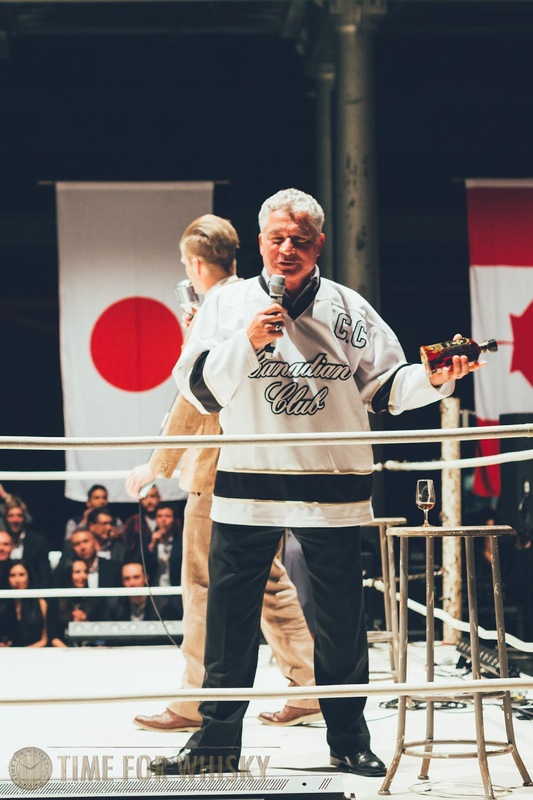 “The Rumble is the perfect setting to really hash out who has the best whiskey" noted Noe who then proceeded to laude the greatness of Kentucky bourbon whiskey in front of his global counterparts. Noe certainly took the stage well, presenting Jim Beam's small batch bourbon Knob Creek to rally the crowds. It was my first time sampling the Knob Creek and I loved it. I found it to be a big, rich, pleasant, palate engaging bourbon. 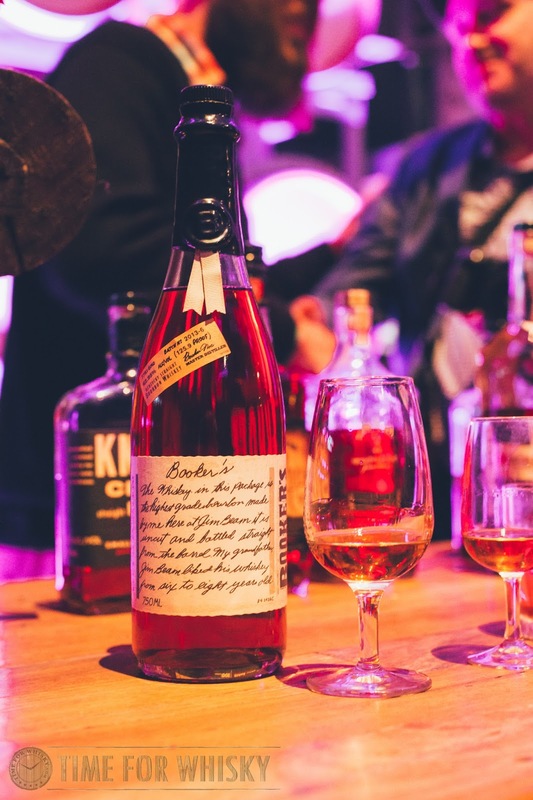 The intense, rich and oaky characters of the Knob Creek showed some resemblance to the characters of Booker's, another small batch in Jim Beam's small batch range. 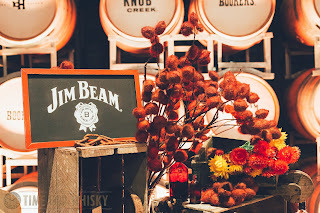 On stage, Noe was clearly proud of Jim Beam and its leading position in the global market. As Noe concluded "The future looks great for bourbon!" - and he is most likely right with all the exciting developments in the bourbon scene. The final contender of the night was Laphroaig's John Campbell. Presenting the Laphroaig 10yo to the crowds; the epitome of the Laphroaig range, the 10yo carried the classic Islay traits, being heavily peated, buttery and layered with smoke and more smoke - the 10 yo, in my opinion packed a good punch to round up the four whisk(e)y variants and helped to seal the night. John spoke to the newly released limited Laphroaig 15yo, noting the story of why the 15yo was resurrected following its discontinuation a few years ago (having been replaced by the Laphroaig 18yo). John explained how Laphroaig fans have lauded the 15yo over the years, and especially once it got discontinued and how it became quite special to Laphroaig backers. This was certainly true, having spoken to few drammers that have confessed their love for the 15yo and even seeing a few old 15yo bottles for signing at the Laphroaig Masterclass (post coming up) - one such old bottle belonging to Martin. Given the special status it held in the hearts of Laphroaig fans, the 15yo was unsurprisingly chosen as the expression that would be released to commemorate the 200 year anniversary of Laphroaig. One main difference with the newly released 15yo is that the new 15yo is made in smaller batches. 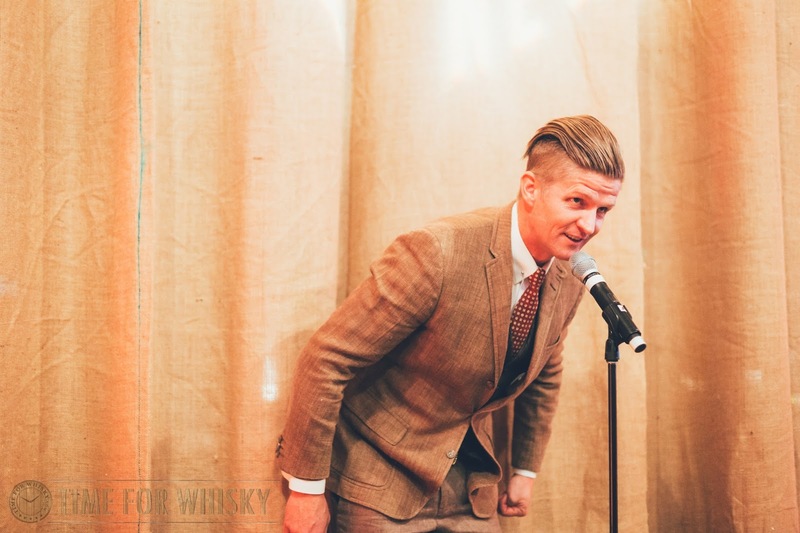 As the rumble wrapped up, the crowds were engaged to select a winner though from memory I recalled all the Whisky greats won the people's choice. 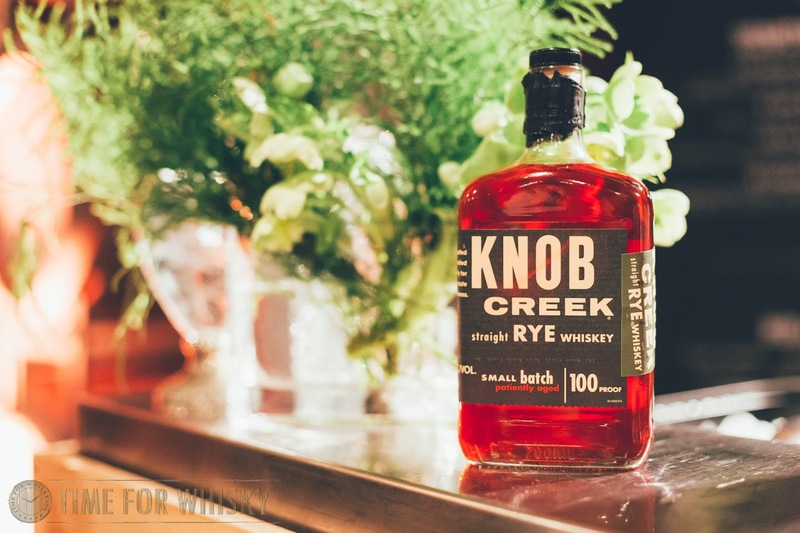 Personally, I enjoyed the Knob Creek, it was a big, rich, intriguing bourbon. The dust may have settled, the crowd subsided but the legends lived on. 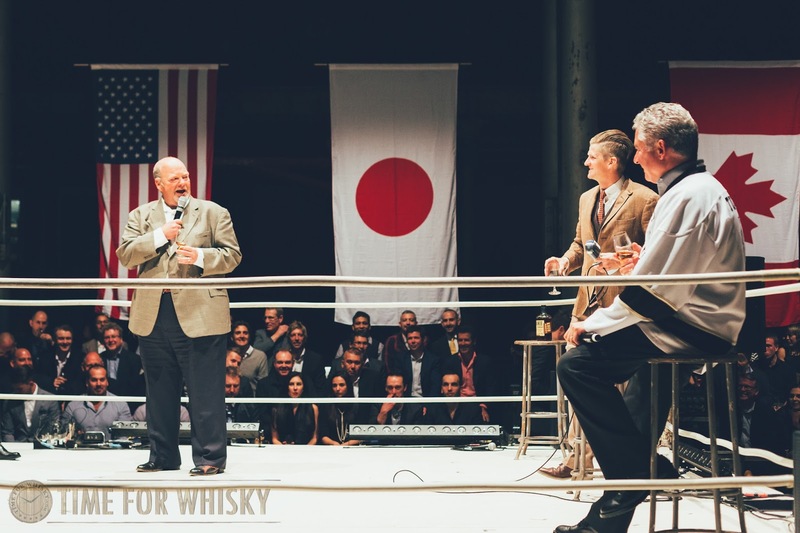 The wisdom of the four whisky greats from the night will forever be ingrained with those that witnessed the rumble. 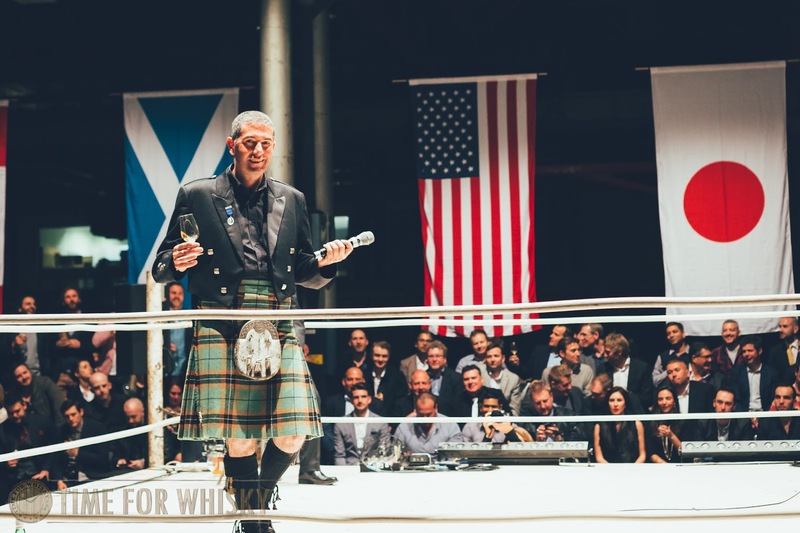 For that this event will go down as one of the greatest whisky events this year. 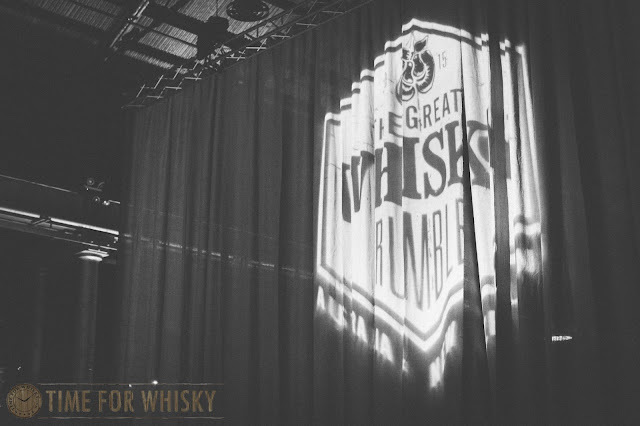 Overall, the Whisky rumble was loads of fun, entertaining, enlightening and insightful. 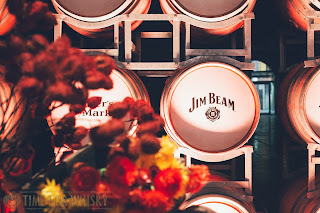 Well done to the Beam Suntory team and Liquid Ideas for pulling this momentous event together and especially for Dan, Mike, Fred and John for banding together on the night to share their special stories. TimeforWhisky.com would like to thank Liquid Ideas and Beam Suntory for the invite to The Great Whisk(e)y Rumble.